with homemade Salsa. 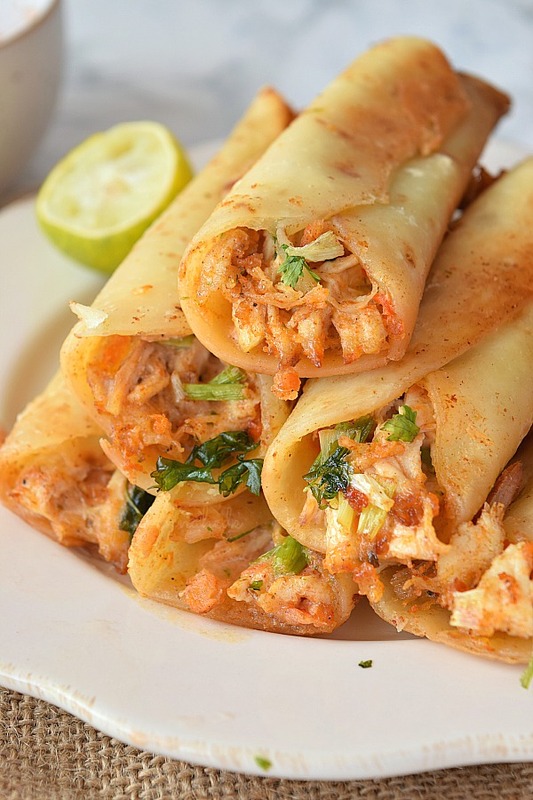 Very easy recipe of Salsa plus,flavorful Chicken Taquitos,best Mexican recipe to try. Mexican food is a favorite of all time and who doesn't love Taco,Quesadilla ,Tex Mex,Burritos? 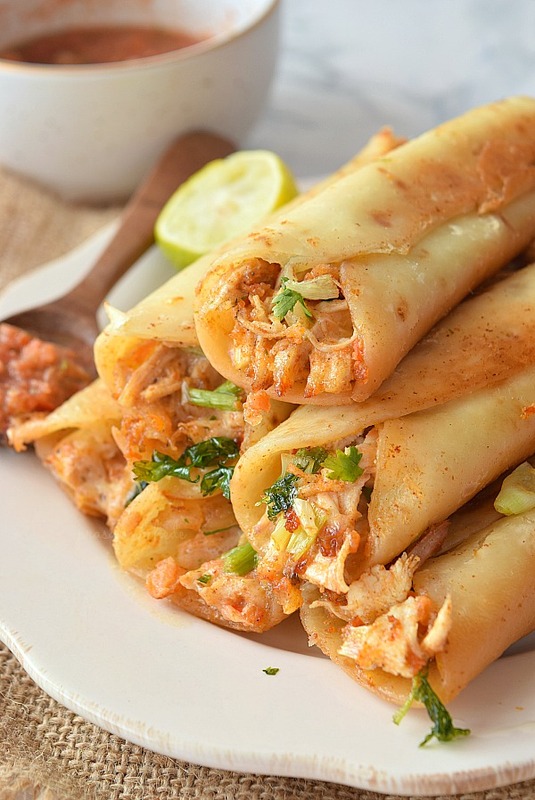 I love taquitos when they are filled with soft,cheesy chicken or beans filling,also when they have shrimp too. Yumm right! This recipe is Best and Easy recipe of Chicken and Cream Cheese Taquitos! 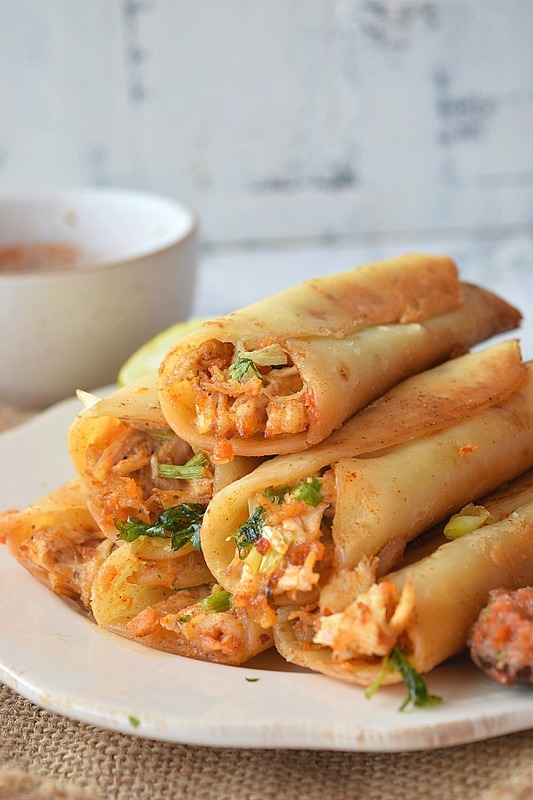 "A taquito (Spanish pronunciation: [taˈkito], literally Spanish for "small taco"), tacos dorados, rolled taco, or flauta (Spanish pronunciation: [ˈflauta], literally Spanish for "flute") is a Mexican food dish that typically consists of a small rolled-up tortilla that containsfilling, including beef, cheese or chicken. The filled tortilla is then crisp-fried or deep-fried. " 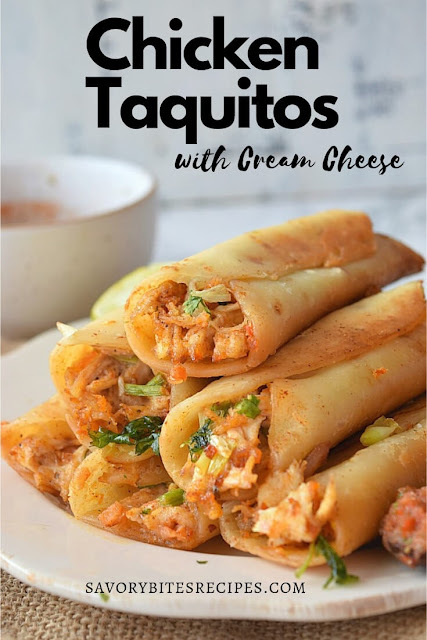 I wanted to add cream cheese to my taquitos as that's one ingredient that I love when stuffed or filled in dumplings or rolls/samosas- cream cheese just makes the filling so so good. 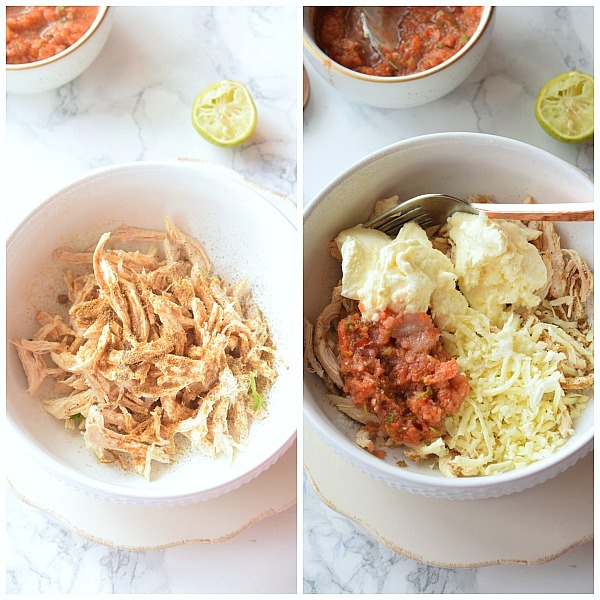 Chicken: Shredded Chicken is to be used in this recipe. 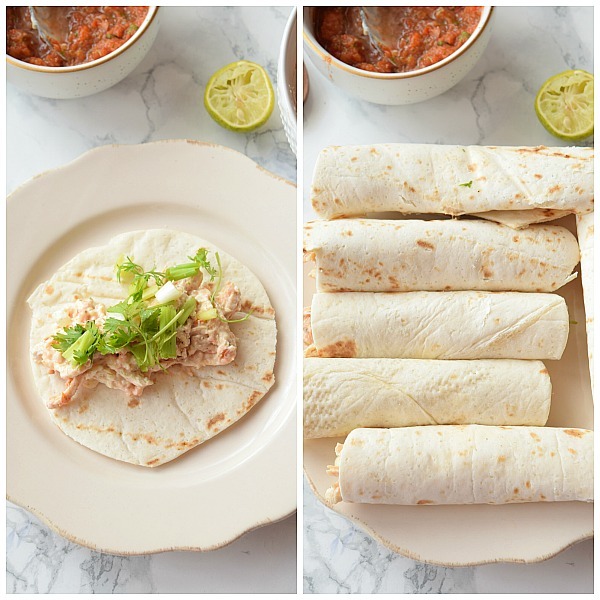 Cream Cheese : This is the best ingredient in this recipe and makes these Chicken Taquitos very creamy delicious. Salsa : I have used homemade easy salsa in this recipe.I have shared recipe also. Sour Cream : Cream Cheese and Sour cream work very well together to give a nice flavor in this recipe. Spices: I have used Pepper Powder,Garlic Powder,Cumin Powder. What you can skip if not available? You can skip sour cream if not available. Also use of cheese is as per personal preference. If you have Colby Jack/Monterey Jack use that or use combination of Cheddar and Mozzarella too. How do I make quick Homemade Salsa? Making Salsa at home is so easy and very under budget. I used to buy those big jars of Salsa and and almost more than half of it used to get wasted unused. So instead of spending lots of money on store bought jars ,quickly made homemade salsa is anytime better. Just pulse in a mixer grinder tomatoes,jalapeno(or any chili if you dont have jalapeno),lime juice,salt,red bell pepper,cilantro,onion,garlic and cumin. Do not make it watery by grinding for a long time otherwise it will turn watery. In a mixing bowl, add the cooked and shredded chicken,spices,salt. Toss well. I have used soft,flour tortilla. You can use corn tortilla too.Use the mini/small tortilla. If using corn tortilla then cover them with a damp kitchen towel and microwave for few seconds till soft and apply oil to tortilla on both sides before adding the filling. Add generous amount of stuffing,spring onion and cilantro. 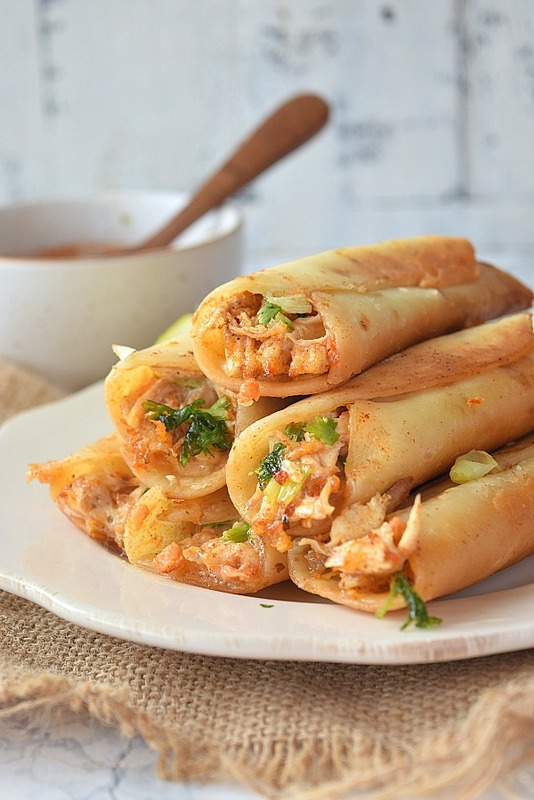 Very delicious Mexican Chicken and Cream Cheese Taquitos,with homemade Salsa! To make salsa,in a mixer grinder add all the ingredients mentioned for salsa and pulse them for few seconds but do not make watery paste. To make the filling, to a mixing bowl,add the chicken along with spices and toss well. Next add the sour cream,cream cheese,cheese,salsa and mix well. To serve,place a mini tortilla,add the stuffing,spring onion and cilantro,roll tightly. Optionally keep it intact with a toothpick. In a shallow pan,add oil enough to cover the taquitos, and when its hot enough,slowly arrange taquitos and fry till crisp. Watch out for the taquitos as they cook very fast. Drain them on a kitchen tissue and serve hot with salsa.